We're a long way from the creative energy, heart, and charm of Henson's Muppet movies, even though I'm not ready for the Henson Company to stop trying. 100 min. ABC. Director: Kirk R Thatcher. Cast: Dave Goelz, Queen Latifah, Quentin Tarantino, David Alan Grier, Edward Hibbert. The Muppets have always had an interest in adapting classic stories. The "Tales from Muppetland" TV specials of the late '60s and early '70s included Hey Cinderella!, The Frog Prince, and The Muppet Musicians of Bremen. 1981's The Muppets Go to the Movies featured movie parodies, and in the '80s Jim Henson dug deep for The Storyteller, with more realistic Muppets blending with human actors in fairy tales and Greek myths. But I trace a certain nefarious stylistic trend in Muppet media to the publication in the '80s of Muppet Magazine. It was fairly innocuous with celebrity interviews and ghostwritten columns in the style of Muppet characters, but photo features entrenched the idea of Muppet parodies. In 1984, the first Muppet parody calendar was released, Treasures from the Kermitage Collection. Fine: here was a cute idea putting Muppets into classic paintings. But in 1995 (five years after Henson's death), a "Muppet Parody Calendar" was released. This unaccountably popular item posed beloved Muppet characters in lame spoofs (a "Kermit Clein" jeans ad, Miss Piggy for "Pigtoria's Secret," and Kermit, Fozzie, Piggy, and Gonzo as the cast of "Frogfeld"), and inspired sequels as recently as 2002. Though 1992's The Muppet Christmas Carol and 1996's Muppet Treasure Island were carrying the torch admirably under the circumstances, the trademark Muppet wit was becoming strained down to "Muppet hip." After the lukewarm reaction to 1999's Muppets in Space, the Jim Henson Company pitched its Muppet features to television, with an eye on home video. 2002 saw varying results from the wan Kermit's Swamp Years (on Starz) and the zesty but overeager It's a Very Merry Muppet Christmas Movie (on NBC). The Muppets' Wizard of Oz aired on ABC on May 20, 2005, and it unfortunately scrapes the bottom of the Muppet barrel. Certainly it was a mistake to try to remake The Wizard of Oz in a Muppet context, tempting as that may be. One day we'll see a faithful remake of The Wizard of Oz (and the rest of Baum's books), but this isn't it. Setting the elephant aside, the telefilm has other problems: a weak script (credited to Debra Frank, Steve L. Hayes, Adam F. Goldberg, and Tom Martin), horrible songs, and a story that makes a human the leading character. That human is pop star turned actress Ashanti, and though she got by in Coach Carter, she seems disinterested here (I share the sentiment). Ashanti plays Dorothy Gale, whose daydream music video "Kansas" opens the film ("Sometimes you gotta get out of Kansas/And sometimes you gotta take your chances..."). Dorothy works in a diner run by her Aunt Em (Oscar-winning Queen Latifah, self consciously doing children's movie acting) and Uncle Henry (David Alan Grier, endearingly amusing). Em serves a sampler platter of platitudes to Dorothy, including "You're not gonna get where you're going 'til you're where you're at," which is hardly The Wizard of Oz's "There's no place like home" or even The Wiz's "Believe in Yourself." A tornado lifts Dorothy and her pet King Prawn Toto (Bill Barretta's Pepe character) to the land of Oz. There she meets rat-like Munchkins; collects Scarecrow (Steve Whitmire as Kermit), the Tin Thing (Dave Goelz as Gonzo), and the Cowardly Lion (Eric Jacobson as Fozzie); and tangles with four witches, all played by Jacobson's Miss Piggy. Jeffrey Tambor (Arrested Development) does a nice turn as the Wizard, given his script limitations, and Quentin Tarantino has a cameo that juices the narrative for a couple of minutes but is otherwise pointless. Original Muppet performer Whitmire still plays Rizzo, and it's comforting to think that Goelz will gladly be Gonzo until he drops. Whitmire has settled into Kermit pretty well, and Eric Jacobson—who has adopted most of Frank Oz's roles since 2000—makes a good vocal match for Fozzie and Miss Piggy. Statler and Waldorf (in brief cameos) will probably never sound right again, but the Muppet staff is on the right track. Other relatively recent additions to the stable continue to contribute good work. Barretta's Spanish-accented Pepe, who ends nearly every line with "okay?" is endlessly funny, and Barretta's Johnny Fiama makes a welcome return appearance as a henchman to Piggy's wicked witch. Rickey Boyd does a good Scooter, and Kevin "Elmo" Clash and Brian Henson (Jim's son) contibute the voices of Clifford and Sal Manilla, respectively, though the characters are operated by others. One suspects that these guys could make the magic happen, with better support behind the camera. But the weaknesses of the script are glaring, in plot and dialogue, and the pacing and production design add to the realization that this is a relatively chintzy affair. The atrocious songs (add "When I'm With You," teh Electric Mayhem's "Poppy Fields," "The Witch is in the House" and "Good Life" to the list) are no more than fodder for a soundtrack tie-in, and composer Michael Giacchino (The Incredibles) proves he's stretching himself too thin. We're a long way from the creative energy, heart, and charm of Henson's Muppet movies, even though I'm not ready for the Henson Company to stop trying. 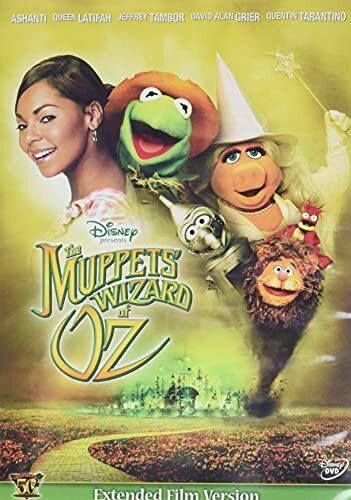 For those who were paying attention, The Muppets' Wizard of Oz was broadcast in HDTV, meaning this release does not feature the original aspect ratio. Inevitably, as widescreen TVs proliferate (and the industry gets more format upgrades), this will see a widescreen re-release. (The film was shot "protected" for Full Screen broadcast, so it doesn't appear to be cropped.) In other respects, the transfer is adequate. A few bonus features are included, aside from the requisite "Sneak Peeks" (of Valiant, Narnia, The Muppet Show, and "Kermit's 50th Anniversary"). First, we get "Oz Oops!" (4:47), a reel of bloopers and kidding outtakes from the production of the movie. This is always a good idea with the Muppets, as the performers tend to stay humorously in character when things go wrong. "Pepe's Exclusive Making Of" (7:21) follows everyone's favorite King Prawn around the set, where he conducts interviews with the human and Muppet cast members. Though marred by hyperactive editing, this featurette is hugely preferable to the common alternative: clips, narration, and talking heads on autopilot. Try staying on autopilot while talking to a Spanish-accented King Prawn. Quentin Tarantino certainly can't in "Pepe's Extended Interview with Quentin Tarantino," an amusing chat with the director and genuine Muppet fan. Of course, kids won't (or shouldn't) get any of the references to Tarantino's R-rated films, but adults will enjoy Tarantino waxing enthusiastic about Rowlf the Dog, a character that's been effectively retired (perhaps in deference to his performer, Jim Henson). Pepe calling the star director "Mr. James Farentino" is inspired. I can only recommend this disc to Muppet completists, as the feature isn't very good. The movie lacks replay value, and the extras aren't enough to compensate. Better luck next time. All site content © 2000-2019 Peter Canavese. Page generated at 04/24/2019 06:59:33AM.